Now, third parties like Panera Bread can use Google's AI app to take your order. We've seen AI-powered chat bots spread across different services, but Google is opening up a way for more companies to get in on the action. With "Actions on Google," you can stay in your app (or talking to an Assistant-enabled device like Google Home) to do something like order food just by having a conversation. 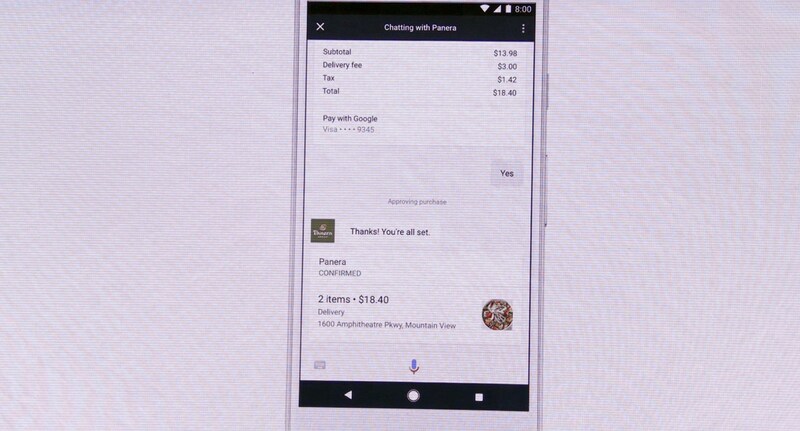 During a demo on stage at Google's I/O keynote today, the company showed off ordering delivery from Panera, without needing to enter your home address or payment information, or even create a specialized account. Support for actions has been available since Google Home launched but only worked with a limited number of services. Now that it supports transactions, it's about to get a lot more useful. Third-party developers can start building in support for transactions now, and Google says it will be open to users on their phones "soon."